Kites, which provide hours of fun during the long days of summer, have three parts. The frame, made out of wooden sticks, gives the kite its shape. The kite fabric, made of paper, catches the wind. The bridle, made of string, connects the kite to the flying line. Although kites are inexpensive to purchase, children find making one just as entertaining as flying one. 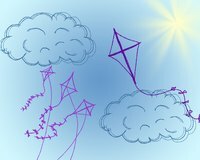 You can find the materials for making a kite around your house or at your local hardware store. Make a cross with two sticks, 35 inches and 40 inches, placing the shorter stick horizontally across the longer stick. Tie the two sticks together tightly with string. Cut a notch, deep enough for string to fit in, at each end of both sticks. Cut enough string to stretch around the kite frame. Make a loop in the notch at the top of the vertical stick and fasten the string by wrapping it around the stick. Stretch the string through the notch on one end of the horizontal stick to the bottom of the vertical stick and make another loop. Stretch the string through the notch at the bottom and up through the other end of the horizontal stick. Stretch the string back up to the top notch of the vertical stick and wrap around the top a few times. Cut off any extra string. Lay the sheet of paper, 40 inches by 40 inches, down flat and place the frame on top. Cut around the frame leaving a 1-inch margin and fold the edges over the frame. Glue the edges of the paper down tight against the frame. Cut a piece of string 4 feet long and tie one end to the loop at the top of the vertical stick and the other end to the loop at the bottom of the stick. Tie another loop just above the intersection of the sticks. Create the flying line by attaching the remaining string to this loop. Tie a small ribbon to the loop at the bottom of the kite for a tail. Decorate with crayons, markers or paint. The string frame should be taut but not tight. Add extra paper to balance your kite.